What will the typical residential solar installation look like in 20 years? Of course, no one knows yet. The residential solar power business is still a nascent industry. It was less than a decade ago that residential solar was only appealing to homeowners with large bank accounts, willing to take a risk on the latest innovation. Today, business is booming. The residential solar business continues to grow at a record rate, with the number of home solar roofs increasing at a rate of 70 percent year over year. Both homeowners and solar integrators are thinking more about the longevity of home solar systems, which is why sales of SolaTrim permanent barrier to protect and beautify solar installations continues to grow as well. We already have some indicators regarding what will happen to rooftop solar systems as they get older. One problem that has become apparent is the damage caused by pests. Birds and squirrels love to nest in solar systems and the debris and bacteria they leave behind create unsightly health concerns. Squirrels seem to be especially drawn to the warmth and protection of a solar array, where they tend to chew on wiring and insulation creating an electrical and fire hazard. And then there’s snow. In the northern regions, snow build-up and ice dams can cause structural damage over time. 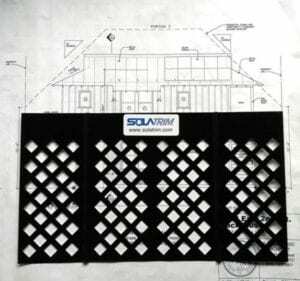 Our customers report that the SolaTrim protective barrier is effective against birds, animals, and snow buildup. It has a long-lasting, attractive coating that provides a permanent protective solution for solar systems. And the military-grade, peel-and-stick adhesive is easy to install and is designed to withstand the most extreme climate conditions. Seeing is believing, which is why we are offering free samples so you can see for yourself that the SolaTrim protective barrier is both effective and attractive. Contact us today to get a free sample of our protective barrier so you can see for yourself how SolaTrim can beautify and protect any solar system. Contact us today for your free SolaTrim sample at info@solatrim.com. See the protective power of SolaTrim for yourself with a free sample.